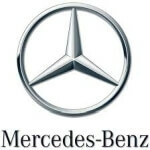 Mercedes-Benz is a global automobile marque and a division of the German company Daimler AG. The brand is known for luxury vehicles, buses, coaches, and lorries. The headquarters is in Stuttgart, Baden-Württemberg.